Pilsen in Bohemia (modern day Czech Republic) had a unique combination of ingredients and circumstance to create the Pilsner style. First, the surrounding country produced light 2-row Moravian barley, considered the finest light malt for brewing beer. Second, the country produced a hops originally known as Zatac red, now called Saaz (from Zatac). Saaz hops is a noble hop prized for its aroma. Pilsner Urquell uses 100% pilsner malt, with no other additions. 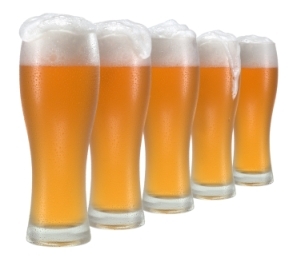 Some home brewers will use a small amount (<10%) CaraPils or very light Crystal malt to add body and head retention. You can get additional recipes of all kinds from BeerSmithRecipes.com. I hope you enjoyed this week’s article on Pilsner Beer. Thanks again for visiting the BeerSmith Home Brewing Blog. Please consider subscribing or leave a comment if you enjoyed today’s article. I brewed my first pilsner last weekend. All grain, step mash with a protein rest at 125° and saccharification rest at 153°. Everything went well until I was ready to pitch my yeast (White Labs WLP830 German Lager). The starter reeked of sulfur. We decided to abort with that starter – luckily my friend was brewing a vienna right after my pilsner and I was able to swipe a portion of his starter (Wyeast 2308 Munich Lager). I’ve read that German lager yeasts can produce a slight-to-moderate sulfur odor, but I still think mine was contaminated. Anyone else had a similar experience? Getting ready to brew my first pilsner, or lager for that matter, and looking up recipes. Thanks for the info. I spent four years teaching in Slovakia and made many trips to Czech Republic and really developed a taste for the pilsner in both Czech Republic and Slovakia. It’s not Monrovia, by the way, it’s Moravia where the malts come from! I spent lots of time there as well. The all grain Bohemian pilsner recipe uses British pale malt for the base! Seriously? Pilsners are brewed with pilsner malt! There’s so many recipes out there on the interwebs, but so few are good recipes! I’m sure it makes a tasty hybrid lager, but that ain’t no bo-pils! I want to use a reverse osmosis system to purify my water but i don’t know how much residual minerals i”ll get after that. Is there a way to know how much i need to add to get to pilsner water profile ? I’ve been tinkering with a Bohemian Pilsner recipe for the last 18 months or so and have pretty much got it where I want it now. I have a water still to make my own distilled water which I then add minerals back to when I brew with it. I use over 95% Bohemian Pilsner malt (Weyermann), with the rest being made up of 2% or so each of acid malt and melanoidin malt. I mash it at 63C for 40 minutes, 72C for 30 minutes before mash out (BIAB no sparge), then boil for 90 minutes adding Saaz at FWH, 80 minutes and 15 minutes to around 40-45 IBUs. Will experiment with a flameout addition of Saaz on my next batch. Fermented with Wy2001 at 10C. Taste wise it comes in very close to Urquell, it’s just missing the aroma for some reason. In any case it’s very nice and it is brewed once every three batches so I always have it on tap. Cheers!